Award-winning playwright Ayub Khan-Din has returned to his native Salford for the world premiere of his new play All The Way Home, performed by the highly respected Library Theatre Company opening their new season in association with The Lowry. Billed as a contemporary and emotional comedy-drama set in Salford that details the life of a family as they unite to face the death of their brother from cancer, it is directed by Mark Babych who has assembled a team of excellent actors from the local area. Familiar faces include, from Coronation Street, Judith Barker, Paul Simpson, Kate Anthony, Sean Gallagher and Naomi Radcliffe while actors Susan Cookson, Julie Riley and James Foster will be known to regular theatre-goers. Ayub Khan-Din rose to fame in the 1980’s, appearing in “My Beautiful Launderette” and “Sammy and Rosie get Laid” but is most famous for writing “East is East” and “West is West”. He called on his own experience of losing a sibling to write this play which explores the relationships we have with our roots, and with those we love but don’t always understand, where “long harboured resentments rise to the surface and loyalties get tested as family bonds unite and divide”. Whoever said the “family is a haven in a heartless world” was probably right, all things considered, for most people most of the time. Yet the family is also quite often a place of war, of bitter rivalry, resentment and mis-understanding. But haven or war zone or simply at a moment of cease-fire, when trouble comes calling that’s where most of us ultimately return despite our differences, disagreements and squabbles – home, back to our roots, our families, where we came from, no matter what has happened to all of us in between times and while other things, people and places may have changed us, we start and usually end with the family. When Brian (played by Sean Gallagher), bound by duty, returns to a Salford in the throes of regeneration, to a family living in the shadow of cancer, he finds that although his hometown and family are familiar they are also very different too, and there are neat parallels drawn between the developments in Salford and the changes he sees in his family. 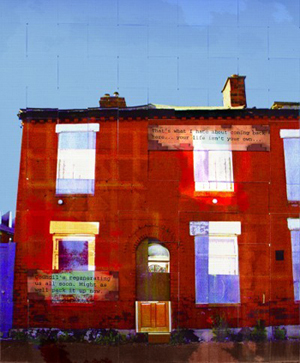 While confined within the walls of their Salford home, a house in a street of boarded up houses (largely played out in the small kitchen) awaiting the death of their brother Frankie who lies dying upstairs in bed, his empty chair in the corner of the room symbolic of his waning presence (and that of the old Salford). They are at the same time trapped and united and caught between feelings of love and resentment, tenderness and cruelty as each family member struggles to come to terms with the loss of a brother and how they feel about each other, demonstrating equal amounts of love, anger, jealousy and mis-understanding. This poignant, intelligent and witty script shows us the family in its raw state, looking at each other like a face in the mirror and seeing past, present and future combined. It is a brilliant observation of human behaviour, and much of it will touch a raw nerve with many. On such a sad occasion they are understandably occasionally maudlin as they remember the old times and hardships but more often than not as befits a tough working class family, they display flashes of humour as they re-live their lives together, their shared experiences, happier times and also revive past conflicts. Scene after scene is played out around the kitchen table – the representation of the heart of the home - with relatives coming and going. This small and busy family kitchen in a run-down Salford home is adorned with all the usual clutter and paraphernalia of a working family room, and overcrowded with people, tentative and tense one minute and then laughing and crying the next. The back door is always open, and the rain more often than not falling creating an air of darkness and gloom and providing an atmospheric backdrop befitting of a Salford scene (I always maintain that it never stops raining in Manchester). There were more cigarettes smoked in that tiny back kitchen in a couple of hours than I’ve seen lit up for years and alongside the kettle the packet of 20 was the most-used prop in the play. The simple act of taking a cup of tea together turns into a study of human behaviour at its best and worst as each word is carefully and tentatively spoken for fear of offending or re-opening old wounds. The kettle is never off, the teapot always full and with the biscuit tin on the table; it is more than simple refreshment that takes place around this particular table. The shared history, the intensity of each character and the complexity of the relationships all unfold as they sip and slurp. Taking tea with his older brother Brian (the one who left for London), Phillip the youngest (played by Paul Simpson) is tentative as he doesn’t really know Brian at all. He offers him the tin of biscuits, a large selection of bourbon, rich tea, custard cream, chocolate digestive, hob-nobs and wagon wheels winking as he comments that it is always full because “he knows someone” and when Brian chooses the chocolate digestive “the Man. United of the biscuit world”, Phillip remarks “funny that, I thought you’d be a bourbon man” with nothing much else in common, the shared biscuit experience is all the more touching and revealing. The fast-paced script, littered with wit and pathos was strung neatly together with serial silences that spoke volumes when siblings with little in common but their roots were thrown together by the sad circumstances. The family seem to have been allotted roles – a little stereotypical, but nonetheless true –which they all fulfil; peacemaker, trouble causer, wise-one, just-like-her-mother, the-snobby-one, the-one-that-left-for-success-in-London (always London) and it is true, they exist in almost every family and are well characterised here. Julie Riley as Sonia (trouble) plays a former drug-addict and veers from aggressive and downright nasty to vulnerable and lost as she waits for the death of Frankie. She alongside her Auntie Sheila (Judith Barker) has some of the best one-line put-downs in the whole play, displaying bitterness towards almost every family member. Janet (Susan Cookson) seems initially to be the most grounded, doing everything for Frankie and moving back to the family home to help out, but when the time finally comes and the funeral beckons, she reveals her loneliness and the sense of purpose she had in caring for her brother. Brian can’t understand what has happened to his sister – “you used to be so happy, to do so many things, bingo, library....” to which she replies “bingo got burnt down and the council replaced the library with an Estonian lad on a motorbike with saddle-bags” a neat little sentence that encapsulates her own fatalistic outlook on what she sees as a life not lived. The funniest scene of all takes place around the table (of course) when Brian, guilt-ridden, battered by constant digs (you could’ve phoned, she’s your sister/he's your brother, everyone asked where you were) and trying his best to make up for the many lost years his family think he owes them, decides to prepare a roast dinner for “the whole family”. He cooks the lamb and serves it pink, adds garlic to the potatoes, tosses the Brussels sprouts in sesame seeds and delicately cooks the mange-tout. Carol, the-sister-never-forgiven-for-moving-to-Didsbury, played by Kate Anthony serves the wine “from Waitrose” while Sonia serves “lager from Asda” and momentarily to the sound of Ken Dodd’s “Happiness” you are deluded into thinking all is well – a picture-perfect family scene straight out of a Nigella manual. But Auntie Sheila, drunk on Snowballs and insistent that the meat is raw, the peas should have been podded, that garlic is for “Pakis” and sesame seeds cause her daughter Samantha (Naomi Radcliffe) to break out in all manner of allergies causes the biggest scene and upset so far, and after slurs and resentments have been aired by all, she decides to leave the family home for good in dramatic style. Drunk and in charge of an anorak, her gyrations in trying to get into her coat caused the biggest laugh of the night; she’d do well on Strictly Come Dancing! I was a little worried when reading the pre-amble for this play that I was going to have to sit through an issue based drama that raised awareness of cancer while portraying the working class in an over-sentimental light, but it was far from that. Khan-Din has done well to bring us a real family with all their grief, warmth, hostility and humour and none of the usual gloss and air-brush. Go along and see it, it’s a great piece of drama, full of wit and wisdom. Perhaps you will recognise someone, somewhere or something of your own family! The acting is authentic and the characters so recognisable that it feels like you’re invading the family kitchen, you might even get offered a cup of tea and a biscuit! But hurry, tickets are selling fast and you don’t want to be left with the Man. City of biscuits (that is, those at the bottom of the tin). Editor's Note: Jane Turner, maybe you should have a look at the Premiership, because at time of writing Man City are only in 2nd place to Manc Utd on goal difference - and 1 goal at that. Just because the writer's got rose tinted spectacles, doesn't mean to say you should when reviewing.